The workshop will focus on the preparation of a variety of surfaces suitable for oil painting with a special emphasis on preparing for intensive painting campaigns. Contemporary methods and materials will be discussed and demonstrated including the preparation of paper and panels, as well as canvas mounting and stretching. A selection of papers and varying types of panels will be presented in conjunction with a variety of commercially available surface preparation materials. The workshop will also focus on a DIY approach to promote cost effective painting campaigns as well as an experimental approach to oil painting. Each participant will receive a sample piece of paper to prepare as well as small sample panel to mount either canvas or paper. The paintings and drawings have been made and now its time to exhibit your accomplishments. This workshop presents a variety of quick and inexpensive methods of preparing your work to look their best for exhibition. Discussion and demonstration will cover the full range of framing options but focus on the least expensive with an emphasis on DIY. Most materials and tools to be presented are available from your local home improvement center. The workshop will explain framing anatomy in regard to specific works. 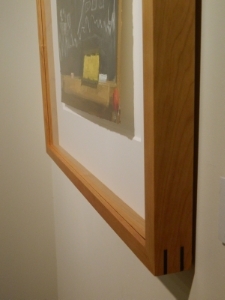 Workshop demonstrations will include mounting works on paper, creating strainers for works on panel, measuring, cutting, and building frame stock, as well as mounting paintings into the completed frame. Students are encouraged to bring finished works to discuss specific framing options. The first half of the workshop will be devoted to discussion and demonstration with the second half devoted to working on each participant's specific project.